The H40B Tow Behind Finish Mower has a 900mm (38 inch) cut and is very stable when being towed by an ride on mower, ATV or UTV. Hitrax Products mowers are imported from the USA and suitable for Australian conditions. It can be offset to enable you to cut under trees and close to trees and objects. 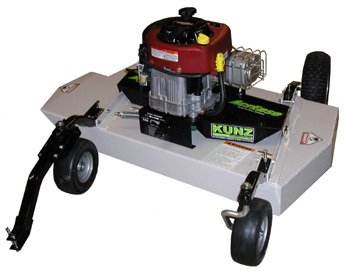 The offset also enables you to cut close to water or on sloping blocks as the mower is on the side.The H40B Finish Mower leaves your lawn mulched and neatly cut it also has smooth operation. NEW STOCK JUST ARRIVED - H60B Tow Behind Finish Cut Mowers have a ATV or UTV fitting which works with tow vehicles. It has 3 rows of blades for a superior cut. 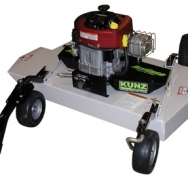 Hitrax Products is the Australian Distributor for all AcrEase tow behind Mowers made by Kunz Engineering in the USA.